Before building any outdoor structure, consult local building code requirements for permits, setbacks, or other restrictions. Safety first! The use of standard safety equipment reflects good industrial common sense when working with all types of building materials. Eye protection, dust mask, and gloves should all be used when sawing or machining any type of building material, including wood products, treated or untreated. Practicing good personal hygiene at the completion of any construction project also applies. For a nicer appearance, avoid the use of short lumber lengths on deck and seating surfaces in order to reduce the number of visible joints. Use hot-dip galvanized or stainless steel fasteners and hardware for all connections. For more details on fastener and connector use in treated wood, click here. When nailing toward the ends of lumber pieces, blunt the nail points or predrill the holes to avoid splitting. When construction is complete, apply a water-repellent sealer to all exposed wood surfaces. For additional details on sealers and finishes for treated wood, click here. Dispose of pressure-treated scraps properly, through normal trash collection or by burial. Do NOT burn pressure-treated wood! For additional information on proper handling and storage of pressure-treated wood, click here. Even Fido deserves to live in style. Pressure-treated Southern Pine is safe for use around people, plants — AND pets. Here’s a project that’s easily accomplished in one weekend. Make it a family project. Your four-legged best friend will be the envy of the neighborhood. Pick a spot and get started with the beautiful American Gothic Playhouse that your kids will love. The design of the playhouse includes 35 square feet of interior space plus a two-foot wide front porch. The overall design along with the elaborate trim and spire can accent any home. 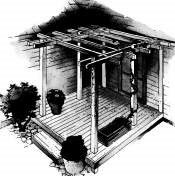 This plan contains an attractive deck design that two handy persons with intermediate building skills can construct in a weekend. Build it with versatile pressure-treated Southern Pine lumber and your new deck will provide many years of outdoor living enjoyment. Decks can work wonders in many different ways… contemporary in style, yet simple and natural. They blend home and landscape with broad, inviting vistas creating a feeling of freedom and expansiveness and offer an oasis of comfort in the open air. Sometimes the best room of the house is outside on the wood deck. Here’s backyard fun for children, a convenient play station for crafts, board games and outdoor snacks. Pressure-treated Southern Pine lumber makes a durable, attractive and functional piece of outdoor furniture that can be built on a Saturday afternoon. Outdoor accents to your deck or patio can be both comfortable and useful. 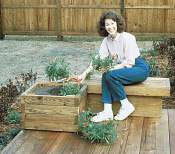 A planter bench can function much like a sofa or end table indoors. And for building a sturdy, long-lasting piece of outdoor furniture, pressure-treated Southern Pine lumber is the perfect choice. What could be more fun for your kids and relaxing for you than a backyard play deck? You can enjoy the warm sun and enjoy a glass of lemonade on the deck while your kids play in the sand or water. That’s right, you can build the play deck with a sandbox or a pool. Or, why not make two play decks side-by-side – one with a sandbox and one with a pool? Enjoying your backyard can be relaxing, but it can also get crowded. There’s lawn furniture, gardening tools and supplies, camping gear, maybe even pool equipment. And don’t forget the bicycles, tools, and other odds and ends that just can’t find a parking place in the garage or basement. 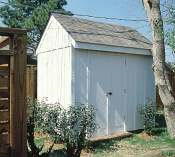 An outdoor storage facility is the answer to your bulky storage problems. When you build one with durable pressure-treated Southern Pine, you can count on long-lasting protection for all those items you need to stash away and secure. Taking out the trash and chopping firewood can be two chores no one really enjoys. And most people do not want the sight of trash cans and firewood to be part of their backyard landscape. Pressure-treated Southern Pine offers an answer to both concerns. 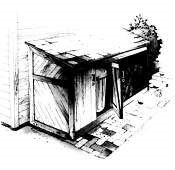 Use it to build a handy storage unit to organize the woodpile and conceal the trash containers. This project plan will show you how. A trellis can function as a unique sunscreen or can be the framework for an outdoor hanging garden. And building it with pressure-treated Southern Pine lumber adds durability to its beauty. The waterborne preservative is nonleachable and will not harm plants.